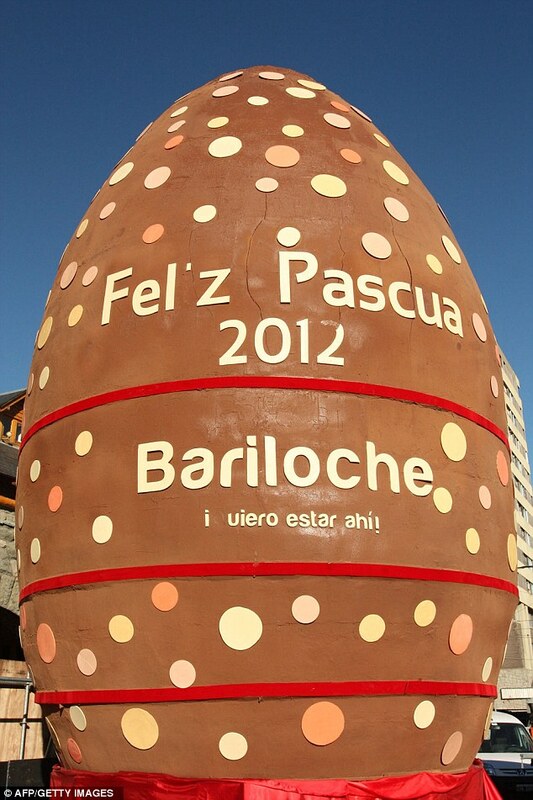 Weighing in at over four tons, a contender for the world’s largest Easter egg was unveiled to a crowd of chocolate lovers in Argentina. Twenty-seven bakeries worked for two weeks to make enough chocolate for the gargantuan concoction wheeled into the Chocolate Festival in Bariloche. Towering over 27ft high (8.5m) and 16ft wide (5m), the sweet treat required a reported 8,800lbs (8,000kgs) of chocolate, hovering over a sea of spectators who gathered for a taste.World’s biggest Easter egg. A large number of chefs from the local association of chocolate makers, an organization which brings together about 18 local producers, worked to create the massive egg. Bariloche is renowned for its local tourism offerings, beautiful landscape, and tradition of chocolate production.